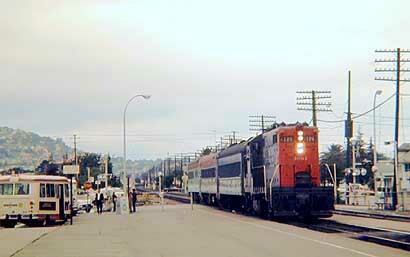 In pre-Amtrak days the Southern Pacific ran two trains up and down its Coast Line between downtown San Francisco and Los Angeles. Here are two pictures of the Lark, the one that ran overnight with full lounge, sleepers, dining and chair cars. The first was taken just before Christmas 1967 in Santa Barbara, where the Railway Post Office car was bursting with holiday mail. The second is of the last Lark, which I photographed on the morning of April 8, 1968, in Redwood City, where I was living at the time. There was a huge public outcry at this train-off, and the last run was bursting at the seams, but SP was always happy to turn a deaf ear to its riders and the public at large when it came to passenger trains in those days. I can remember the railroad frequently announcing a particular train was completely 'sold out' to those seeking reservations when, if fact, it would run nearly empty, thereby inflating its deficit. On one City of San Francisco trip I took they had removed all silverware from the diner and the crew had to get off in Sacramento to buy plastic cutlery from a Woolworths near the station. The outraged veteran dining car supervisor showed me a letter from the director of passenger services reminding staff that it was not the policy of the SP to encourage passenger service and that personnel who did so would be disciplined. 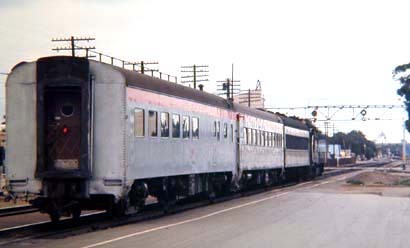 The Mainstreeter was the Northern Pacific's 'secondary' transcontinental train. 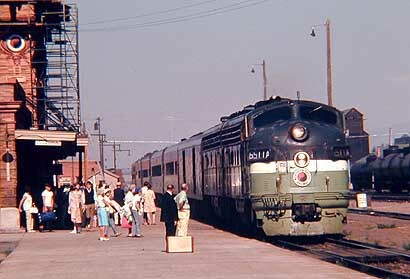 Running between Chicago and Seattle, it made many more local stops than the North Coast Limited, the premier varnish on the route. Here are two shots, taken in and near Missoula, Montana, in 1969. Normally, the train carried a slumbercoach, dining-lounge, coffee shop-coach and reclining seat coaches. But as can be seen in one of these photos, it was occasionally graced by a dome -- and a lot of front-end revenue. Today, thirty years later, regular passenger service to Missoula (on the NP and Milwaukee Road) is long gone, though talk about its renewal comes and just as quickly goes. 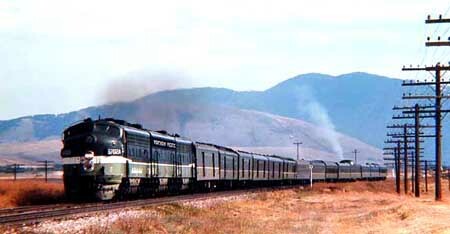 Great Northern trains competed directly with the Northern Pacific across the top of America from Chicago to Seattle/Portland. Here are two photos from the early-mid 1960s. 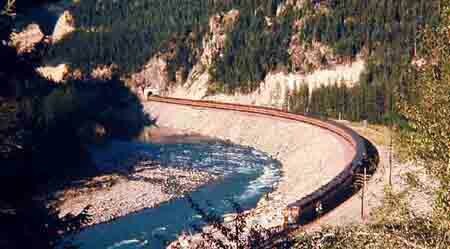 The first is a shot of the premier train, The Empire Builder, photographed near Kalispell, Montana not far from Glacier National Park in the summer of 1966. 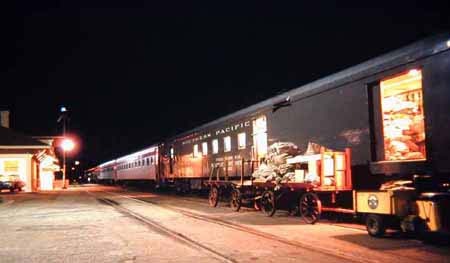 Its consist of over 20 cars included many sleepers and dome coaches, a Ranch-Lounge, dining car and Great Domefull length car with a bar in the lower section. The second is of The Western Star, taken in Spokane in 1968. The Star carried coaches, a lounge-dining car, sleeping cars -- and a lot of mail. Of all the fine NP and GN transcontinental trains, only the Empire Builder remains, and in name only on Amtrak. 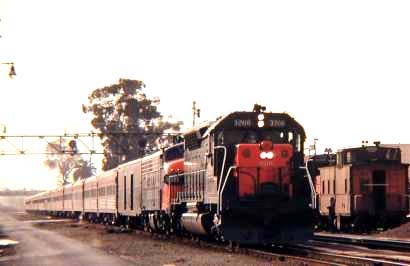 Now that Amtrak is thinking of running a Talgo to Monterey, south of San Francisco, it is time to remember Southern Pacific's Del Monte. These photos, taken in Redwood City, on the Peninsula Line, in 1968, catch the train in its last days. Running south, it left San Francisco's 3rd and Townsend station at 4:50pm, arriving in Monterey at 7:55. The return departed Monterey at 8:00am, arriving in San Francisco at 11:15. More a train for upscale shoppers than commuters, its consist included a parlor shack lounge car and chair cars with news agent service. Till the end its bartender service was famous, though increasingly, as these photos suggest, threadbare.